Before coming up brief with the topic, we would like to know about resolution, what is Resolution? How is it associated with the PC’s or Laptops? What role has resolution has to play with designing of apps? How is it related to a pixel? Resolution is the potential of the sensor to observe or measure the smallest object clearly. There is a difference between the resolution and a pixel. A pixel is actually a unit of the digital image. Resolution depends upon the size of the pixel. With a given lens setting the smaller the size of the pixel, the higher the resolution will be and the clearer the object in the image will be. Images having smaller pixels might consist of more pixels. The number of pixels correlates to the amount of information within the image. In today’s era of computing, laptops are made to run on high resolutions. While the present and upcoming apps support the feature of high resolutions, the older desktop applications are obsolete in their design patterns and they are difficult to use because of their smaller size as they aren’t supported to run on these resolutions. The older laptops supported the feature of low end resolutions i.e. 640×480, 800×600 etc. This made the desktop apps to run smoothly without any difficulties. But now, newer laptops support higher resolutions i.e. 1920×1080, 3840×2160 etc. making the older desktops apps to see tiny and unnoticeable in these laptops. I came to know about this problem when I got my Dell Inspiron 14R, i-3 processor. As its resolution was not high compared with today’s newer laptops, and the applications made a great impact but it was the touch experience that disturbed me a lot. 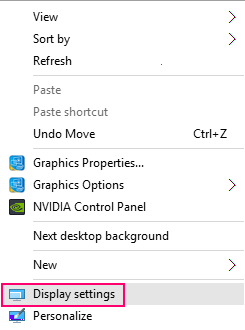 Overall, operating the desktop using touch on screen was a bad experience for me.If you are on a PC or a laptop which is has a resolution of 1920×1080 or greater and having difficulties while accessing any older desktop applications, you can try out these following steps. 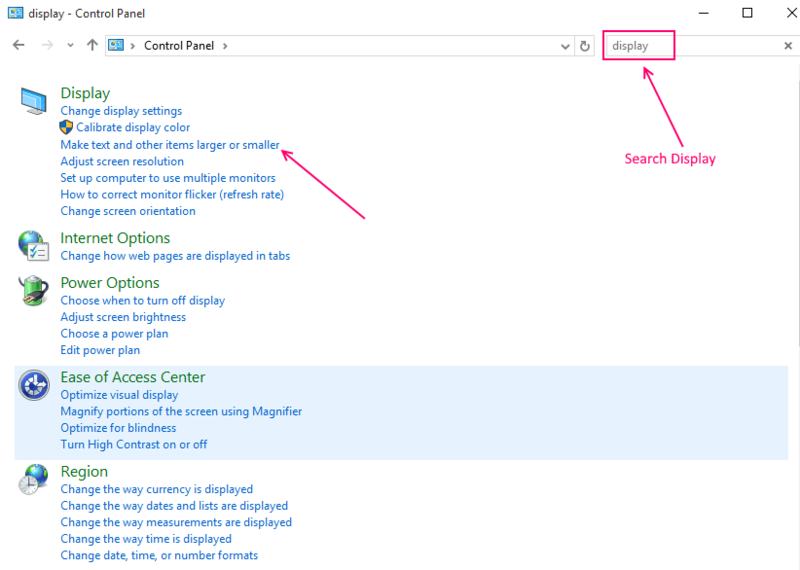 Step 1:– Right-click on the desktop screen anywhere and click on “Display Settings” from the Context menu. Step 2:– Increase the slider bar to 125% or any number as per your wish. Note that 125% is advisable or recommended by the PC or laptop manufacturer. 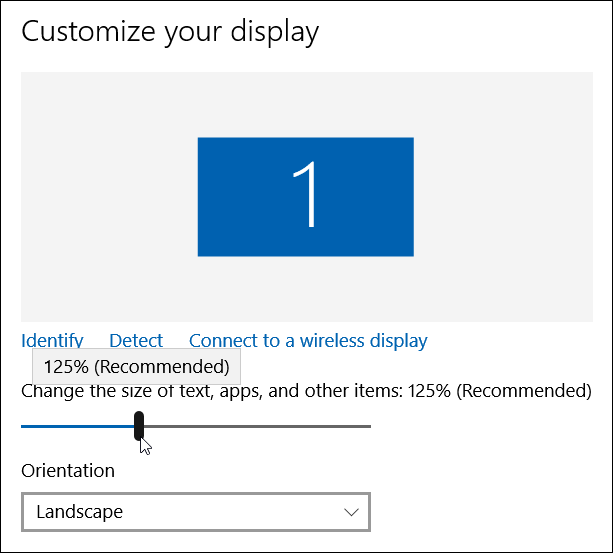 If you are not satisfied by the display of the older desktop apps now, you can also use the “Custom Scaling Level” option provided in the control panel. 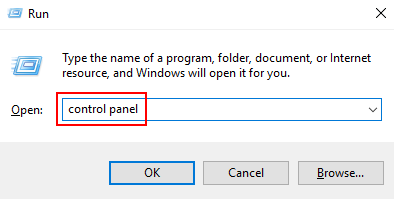 1 – For this option, press Windows key + R and Open RUN. Now, write Control panel in it and hit enter to open control panel. After this, click on Control Panel. In the Control Panel, Search Display in the search box and then click on make text and other items larger. 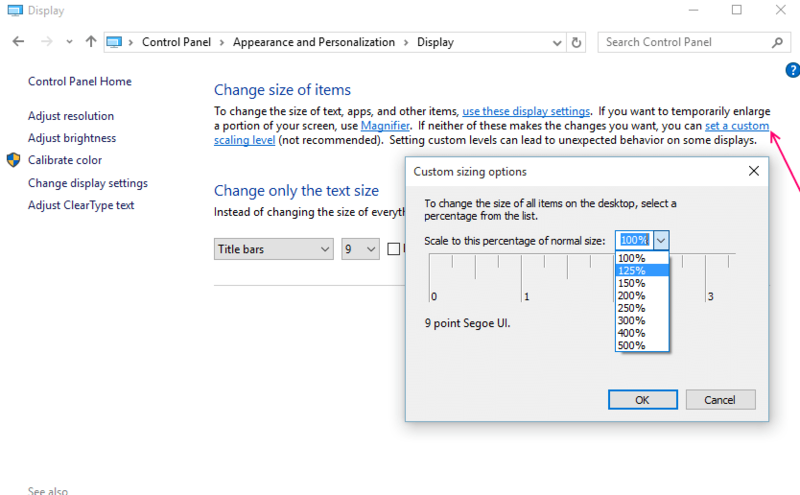 In this section, you will have to click on “set a custom scaling level” and change the size of all items by selecting an appropriate percentage. A higher percentage indicates in a greater size of an item a vice-versa. You can also increase or decrease the size of the items by dragging the ruler in the custom sizing options. Click on OK when you have found the desired outcome. Step:-3 Click on Apply and you will be asked to sign out from your Microsoft Account on your Windows 10 and then sign in again for the desirable experience. The Universal apps on windows 10 already offer the high end resolution experience but the method described above shall make the older desktop apps to run on these high end resolution PC’s and laptops very comfortably.